Are there some tools or commands I can use to send USSD codes for checking balance and data balance of the GSM SIM Card in my USB modem (Mobile broadband dongle)? V Mobile Broadband is the original Vodafone Mobile Connect software for Linux rewritten to be compatible with Network Manager by Vodafone's open source Betavine Connection Manager team. Unfortunately, it doesn't seem to be very actively maintained at the moment and isn't available in Ubuntu repos. However, you may try your luck building the project from source. Check out their GitHub page. Warning: v-mobile-broadband depends on wader, which replaces Ubuntu's default modemmanager. So, if you encounter problems with the new setup and decide to uninstall v-mobile-broadband, don't forget to reinstall modemmanager package. In Ubuntu, is there an application like “Huawei Mobile Partner” for broadband dongle modems? For installation and configuration instructions and more details, see here. You can use AT commands directly to query your balance via USSD. For that, use any serial terminal program that lets you communicate with your modem directly (putty, minicom etc.). This assumes that your modem is at /dev/ttyUSB1. The AT command in the second atinout command is just to get the unsolicited USSD answer displayed as a side effect, which should have arrived after the sleep. For the case that querying your balance requires operating a USSD menu: this is also possible with atinout, see this answer. You can do them with the package modem-manager-gui. But it is only available for 13.10. In other versions you have to manage them in Terminal with the package modemmanager. You can use the Linux command line tool gsm-ussd to send USSD codes, get answers, and even navigate USSD menus (though that was not stable / usable for me). For detailed installation and configuration instructions see here. The version 0.4 Debian package offered there for installation is the latest dev branch version. Start by listing your modems: mmcli -L. This will show a modem device path like /org/freedesktop/ModemManager1/Modem/0. The number at the end is the modem index, remember it. For the case that querying your balance requires operating a USSD menu: this is also possible with mmcli, see this answer. It's disappointing to see just the first useless line: You have:. Now, you need to know your modem port; in my case, it is /dev/ttyACM0. You can use the open source virtual PBX solution FreeSwitch together with its extension GSMopen to send USSD commands [source]. There are simpler solutions in the other answers of course, but in case you use GSMopen anyway (… for example because it's the only way to do GSM voice calls under Linux …). Not the answer you're looking for? Browse other questions tagged usb-modem ussd or ask your own question. How to book and use Internet Packs for a Ncell SIM card, using Ubuntu? 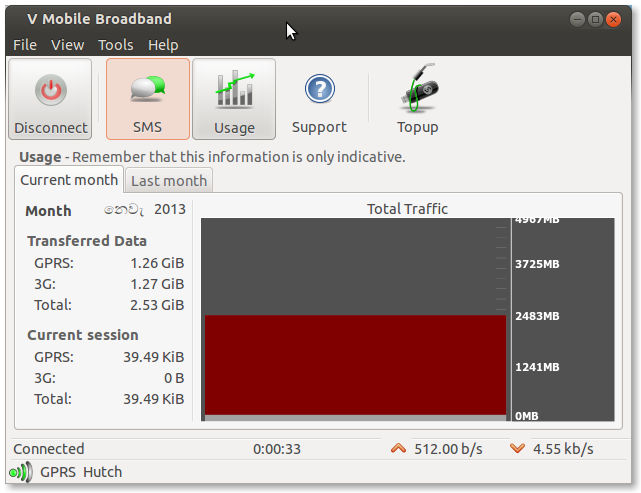 USB mobile broadband dongles in Ubuntu (14.04)? Where to start? How to add D-link dwm-156 to usb switch mode for automatic eject of driver CD / switch to modem mode?